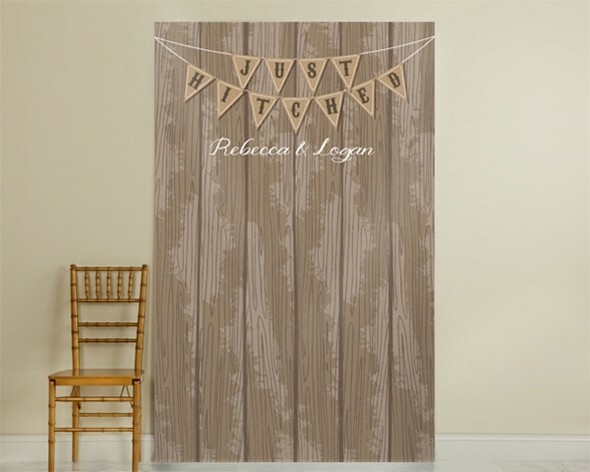 Perfect for a country or rustic-themed wedding, this fun photo backdrop features a wooden-fence motif with a pennant banner spelling out "Just Hitched" May be personalized with the happy boot-scootin' couple's names or a custom text line (up to 20 characters) below the words "Just Hitched." Available only in the colors and fonts shown. PLEASE NOTE: Mounting supplies are not included with the backdrop. Each backdrop ships in a mailing tube and is made of tear-resistant 7mil polypropylene that is water-resistant with a scratch-resistant coating.